Effective development interventions often require thinking outside the box. In southern Malawi’s Lake Chilwa basin, where environmental degradation, public health, and population dynamics intersect in unpredictable ways, people like Deepa Pullanikkatil of Leadership for Environment and Development (LEAD) are challenging conventional thinking with promising results. Climate change adds another layer of complexity. Temperatures have risen by 0.9 degrees over the past 40 years, Pullanikkatil says, and changing rainfall patterns and extreme weather events increasingly threaten agricultural livelihoods. In 2012, as much as 70 percent of the lake dried up, devastating local communities and prompting an outbreak of cholera. “It was quite a shock for us,” she says. The outbreak was traced to feces contamination from zimbowelas, or floating huts, which enable migrant fishermen to live on the lake for months at a time, but lack proper sanitation. Pullanikkatil’s work on the Lake Chilwa Basin Climate Change and Adaptation Program revealed more links between health and the environment. She and her team were concerned about the lack of female participation in the program and, upon further investigation, discovered two key issues. First, women reported they were simply too busy raising families to take part in climate adaptation efforts – and not entirely by their own volition. Pullanikkatil reported a high unmet need for family planning, which her team addressed through advocacy and education. They also lobbied to include population issues in Malawi’s National Climate Change Policy. “People were asking, ‘why do you want to include population in climate change policy?’ But we were able to bring out the linkages and convince them,” she says. Second, women were often sick. The program discovered a debilitating parasite called bilharzia was spreading through irrigation systems that had been originally installed to help farmers adapt to climate change. After convincing local authorities of the scale of the problem – disease prevalence rates were as high as 49 percent rates in some areas – medication was distributed more widely. “We’re not health experts; LEAD is an environmental organization,” says Pullanikkatil. But by identifying cross-sectoral links and partnering with others, she and her colleagues have been able to address some of the basin’s most difficult health and environmental concerns. 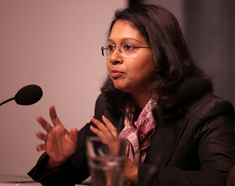 Deepa Pullanikkatil spoke at the Wilson Center on February 10. Download her slides to follow along.